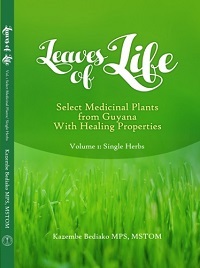 In Leaves of Life, Volume1: Single Herbs, the author of the Behutet series and native of Guyana, posits the view that herbal medicine is becoming more popular in contemporary life and that there is a herbal remedy for any ailment. Scientists have come to recognize the capacity of the rainforest to treat or cure ailments and diseases that plague modern life, such as AIDS, cancers, venereal diseases, heart problems, diabetes, Alzheimer’s, arthritis, infertility, leukemia, multiple sclerosis and more. This priceless resource of over one hundred single herbs, thought to be lost over the generations, will ever be at your finger tips. Herbs are often considered to be safer, gentler, and of lower cost than conventional pharmaceutical drugs. Herbs are safer than modern-day synthetic or lab-produced drugs because they are naturally rich in both biologically active and inert substances. Many of these nutrients have strong antioxidant, detoxicant, scavenging, and dual-functioning properties, which a great number of people do not realize. Herbs do not act like chemical drugs but more closely resemble the orthomolecular substances of vitamins, minerals and enzymes that naturally exist in our bodies. There are those who argue that medicinal herbs usually do not give immediate reactions and are not the first choice to treat severe, life threatening diseases. However, herbs have been used as the primary choice of treatment for thousands of years in Africa, Asia and the Americas. The effects or herbs are subtle and gradual. They tend to fill the needs of one's system as a whole. The herbal properties balance the positive and the negative, gradually bringing the entire body to a natural state. Advantages of natural (herbal) medicines are that they are mild in action, lack side effects at normal dosage, and are relatively inexpensive compared to most synthetic drugs. In addition, crude preparations of herbal medicines, when taken orally, have interesting benefits. With oral consumption, the release of active ingredients into the bloodstream is relatively slow. The low concentrated release of the medication provides for a sustained dosage, which is a possible explanation for the minimal side effects experienced from herbal preparations. The body is not subjected to a sudden surge of chemicals. Instead, the herb is introduced to the body's system slowly and gently. Leaves of Life (LOL) presents an ecological perspective of health and disease as it examines the interrelationships among environmental, cultural, social, and physiological factors. It incorporates the traditional pharmaceutical practices with modern medicine, and presents a compendium of over a hundred medicinal plants from Guyana and their usage. Plants have aided us in the fight against diseases. The remedy quinine from the cinchona bark eradicated the disease malaria; morphia remains perhaps the most effective pain killer; mahuang (Ephedra vulgaris) for treatment of asthma (ephedrine is the active alkaloid component); emetine, the most effective controller of amebic dysentery; rauwolfia used in the treatment of high blood pressure (the alkaloid reserpine being the active principle) introduced the much abused concept of tranquillizers; the heart drug digitalis from the purple foxglove and curare remains one of the most valuable handmaidens of modern anesthesia, not to mention penicillin. Thomson M.D. William A. R. Herbs that Heal . New York: Charles Scribner’s Sons, 1976;12.